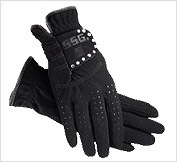 EQUESTRIAN GLOVES FORCOMFORT AND CONFIDENCE IN COMPETITION OR WHEN YOU\’RE JUST HAVING FUN. The perfect combination of genuine cabretta leather back and synthetic leather, aquasuede palm® for grip, breathability, exceptional durability and comfort. The best of both worlds: Appearance & Grip. 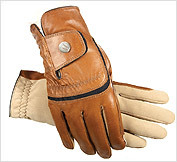 Economical show glove made with drum dyed, colorfast leather for long wear. Spandex™ gussets between fingers for flexible fit. Guaranteed not to stain your hands. Thin and soft. Gathered stitched wrist and back for comfort and neat appearance. Rein reinforcements. For the discerning rider “breathable” non-sweat reinlock pebble construction. The ultimate in feel, comfort, grip and style. 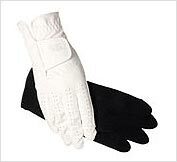 For show jumping or dressage events. Machine washable. The latest stylish riding glove. The SSG GRAND PRIX Bling is the familiar and popular 2000 Grand Prix made of breathable aquasuede plus® palm, tastefully enhanced with Swarovski® Austrian crystals. Great feel, great fit, classically elegant, flashy and fun! For competitions, choose White for the Dressage Arena and Navy for the Showhorse ring! 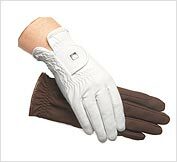 Show Jumping, Dressage, All Event Show Glove, Eventing. The “perfect feel” English show glove, made with aquasuede plus®. 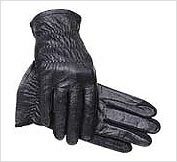 A skin thin, long wearing, machine washable material providing excellent grip. Reinforced in key areas, exceptional touch.